With a creative culmination of local and global flavors, B-Town Kitchen & Raw Bar is bringing you a fusion of Pacific Northwest, Asian and Mediterranean influences right to your backyard. And when we say your back yard, we mean it! B-Town Kitchen & Raw Bar offers a menu full of fresh-caught, sustainably sourced fish and shellfish harvested from the beds of Washington, California, British Columbia, and Alaska. 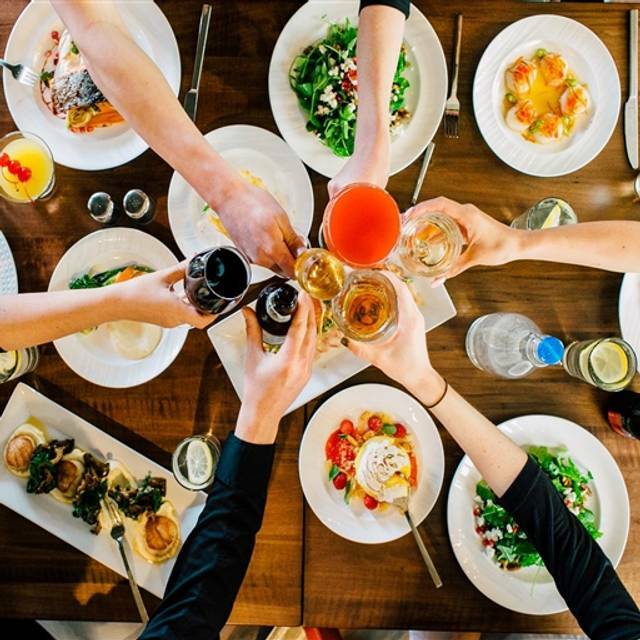 Conveniently located near downtown Bellingham, in the Four Points by Sheraton Hotel, B-Town Kitchen & Raw Bar evokes a fun, urban dining experience. True to its roots, B-Town’s dining room offers a familiar Northwest coastal vibe paired with a mouthwateringly mod twist. From shucked oysters, clams, crudo, shrimp, ceviche and more, we promise there is nothing else like this around! We LOVE B-TOWN. It’s joked about as our “Cheers.” It’s the place where we know what we will get when we get there and we love it every time. The food was okay, but not what I expected for the price. We enjoyed the appetizers (Brussel sprouts and truffle fries) and far more than the main dishes (we had the burgers and the prime rib dip). Outstanding 5 course meal for March Date Night special menu. Great value and delicious. Added on the fresh oysters and champagne. All of the staff was awesome! Very friendly! My partner and I went in for dinner on Valentine's day. The food was delicious and the price was unbeatable! We were disappointed that the tower was no longer available. Which means it is no longer our favorite place to eat, when we are in town. the inner core of the lettuce ( no leaves really) and a store bought dressing. Lack luster. We had to sit outside in the freezing cold despite having a reservation. Other people seated out there simply left without eating. The blankets they gave us, and the heaters they turned, on only helped a little. If we did not have our outdoor coats and hats on we would have not made it through dinner. The food and service was good, bur the idea of seating people outside in ice cold weather is an epic fail. Food was cooked to perfection. While the service and drinks were good, the food was not. The calamari appetizer was chewy. My wife had a crab salad which was little more than some greens with a small amount of crab. My rib eye steak was small and while it was cooked medium rare (which I requested) it was not a high quality piece of meat. I would go back for drinks but probably not to eat. This is a great stop while in Bellingham! Food is great, service pleasant and sharp, ambiance good. First time here, were searching for a Thanksgiving dinner spot. Was served family style, plenty of food and good food too. Our waitress was really exceptional, always there when we needed her. A good overall experience. Jay was our server and was attentive, despite the Thanksgiving rush. The salmon we all thought was excellent; moist and flavorful. Outstanding Thanksgiving 5 course meal! I will never cook at home again! My husband and I went for Thanksgiving dinner. The restaurant was not full when we were there, but the waitress rushed us at an extremely uncomfortable speed. Brought food to table when we barely had one bite from the prior dish. Food was ok, but everything was cold. Was not a great experience and would more than likely never go there again. Piano music was a plus and the booth a very pleasant surprise for my group! Menu is really small right now. I've been here before and was more pleased with the food previous times. Second time here and we loved Threefer! Took their pic while they were playing and edited it a bit. The ambience just did not match what we expected. That is not to say it was bad, it just didn't fit what I expected based on the description. There was WWF wrestling on all TVs and music that was a bit loud for our taste. We were all 50-somethings plus two grand-mothers. So, not to say this is a bad atmosphere, just not at all what we expected. We aborted without order after sitting for 5 minutes. Went here for a surprise weekend away date night dinner- was looking for something fun and upbeat for a date with the hubby and this was perfect. Live (and good) music, good service, fire pits, good drinks, great food... PLUS it’s connected to the hotel, so we could both drink without worrying over who was driving. I wouldn’t go here for a fancy meal, but for an upscale casual date night- yes! We will go there again. The calamari was excellent, the fish and chips were competent, the lobster roll left quite a bit to be desired. Just claw tips and a few small pieces of lobster in something like a thousand island dressing. Not worth going out of your way for. The service was very good, but we were there for lunch on a Saturday and besides my wife and myself, there was just one other paying couple for food plus 2 guys at the bar. Much better than a poke in the eye with a sharp stick. We had a fun girls night here and it was wonderful with the exception of our server. She forgot to put in food orders, took 30+ minutes at times to bring drink orders, and rarely came by the table to check on us or bring water etc. She was apologetic but seemed very absent minded. It did not appear she was slammed with tables (but perhaps she was). We loved the atmosphere of this place and we had a great time, just unfortunate the server was not on top things! Food was pretty good (quite liked the pot stickers), but service was lacking. No familiarity with ingredients in menu items. Actually canceled open table reservation because of lack of training and ambiance is hotel sports bar. 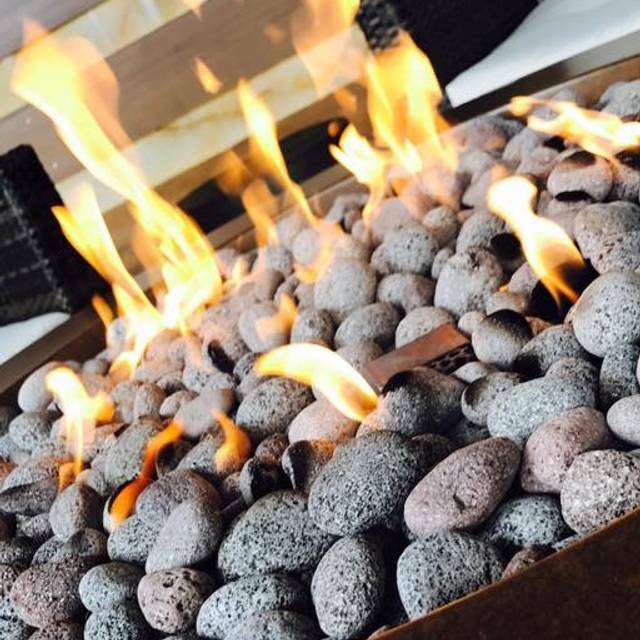 Heated patio with fire pits has potential. Food was just ok. Steak was over priced and the garlic noodles is just spaghetti with butter and parm cheese. Martini was really good though. It was very loud and we had a hard time talking to each other. Great food and HH specials! Unfortunately the staff was clueless ingredients and allergens. They didn’t know what gluten was. The server recommended a dish that was fried in a shared frier or a vegetable poke dish. When I asked the manager, he said was just as clueless. The chef was able to make accommodations. Other than this the restaurant and service were great. If I didn’t have a food allergy I’d go back. Atmosphere is okay (noisy inside but looks nice outside), staff was friendly but if you're going for the food, just don't--can't stress that enough. We went because the reviews sounded great and we were excited to try several items on the menu but the results were consistently disappointing: salad was bland, lobster was chewy and the soup was gloppy and super salty. The wine list was boring and none of the food tasted fresh despite a great list of ingredients. We didn't even stay for dessert--typically my favorite part. Sad experience and would not go there again. Server was very pleasant and enthusiastic, although clearly not trained. Had to ask for appy plates; mixed up items on bills even though we provided info up front about how to divide the bills; brought inappropriate utensils for dessert. Wait staff clearly had a hard time hearing us, as did our small group. Perhaps some fabrics to absorb the sound would be helpful. The food was unique, well prepared and nicely presented. While we all agreed we'd probably try it again, each of us is not recommending to others 'til we see if our uneven experience was isolated or a pattern. With some changes noted above, it could be a B'ham go-to place! Excellent happy hour oysters. Well executed and interesting entrees. The desserts were delicious. The waitress was very nice but the waitstaff was a bit overwhelmed on a busy Friday evening. Great local place with a great happy hour. Service is always great! Overcooked prawns , mussels had no flavour . This is a hotel bar and has sports on tvs so not particularly romantic. Food decent and varied. This is a new establishment and doesn't know how to use open table. We booked outdoor by a fire pit and when we got there they didn't know we had reserved through open table and told us that they didn't do reservations for the the patio even though we were confirmed for outdoor seating. We had explain to them how open table worked.Service was slow and very unorganized. Very little choices for happy hour for drinks and food. Their web site was misleading on their dishes and what they were serving. The prices were way to high for casual dining. We received main courses before appetizers had arrived. One guest had to wait twice as long to get their food because they had messed up the order. Not a very good experience. Fabulous time! We sat outside and had our our firepit. The whole experience was awesome!!! 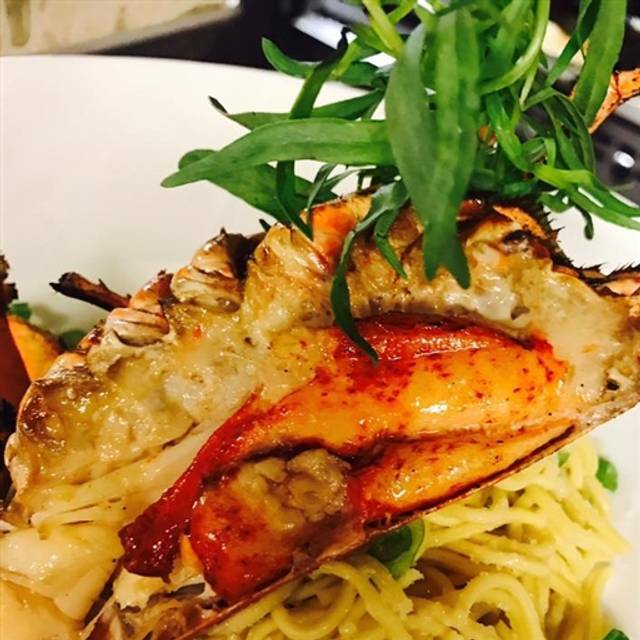 I order the Lobster Noodle dish, it was excellent, as well as a order of Brussels Sprouts.